This past weekend the Kamloops Society for the Written Arts hosted their annual writers festival. Established in 2010 by Sylvia Olson with the help of the Kamloops Arts Council, the three-day event was hosted in downtown Kamloops at the Doubletree Hilton Hotel and the Kamloops Library. Attendees took in readings and workshops from authors Alix Hawley of Kelowna, Chris Bose of Kamloops, TRU faculty member Karen Hofmann and TRU alumni Patrick Blennerhassett. The festival kicked off Friday with a panel discussion with all four authors, moderated by TRU storyteller and writer Alicia Ashcroft. Attendees listened as the authors candidly shared the ups and downs of the craft and personal anecdotes. The night followed with questions of process and creation with different insights from all the authors. Saturday afternoon consisted of facilitated workshops and readings from the panel of authors. TRU’s Hofmann gave a workshop straight from her classroom, educating budding authors and experienced writers alike on the importance of developing your story from the bottom up. Those attending Hofmann’s workshop were encouraged to dive deeper into their stories and get sometimes simple ideas into skillful points fit for successful work. TRU alumni Blennerhassett took a different approach when it came to his workshop. He focused on the importance of marketing yourself and your work after you’ve finished writing – a more back-end look at the publication process. “You’re either going to self-promote yourself or no one’s going to promote it,” Blennerhassett told those at the workshop. Blennerhassett spoke from both an author and journalistic point of view while explaining to fellow writers the process and competition news media swims in. He used a number of his own experiences and interviews to demonstrate the good promotional skills an author needs, as well as things to avoid. Blennerhassett has been a full-time freelance journalist for several years, writing mainly for Business in Vancouver and the publication’s parent company, Glacier Media. Growing up, Blennerhassett always looked at the world through a “question” filter, investigating constantly and debating issues that, in his teacher’s eyes, might have been far beyond him. Blennerhassett’s parents encouraged him and pointed him to focus his inquisitive mind towards developing a career in journalism. He published his first article in 1998 – a concert review of a band called Big Rack in the Kamloops Daily News. “That was it. I was hooked,” Blennerhassett said on his first taste of published writing. Blennerhassett began his career with an internship at the Kamloops Daily News. He has worked in many different news organizations, in government media relations and has published four of his own books. Currently, Blennerhassett is the author of Random Acts of Vandalism, Monument, A Forgotten Legend and The Fatalists. Blennerhassett plans of going back to school at UBC for their graduate journalism program. 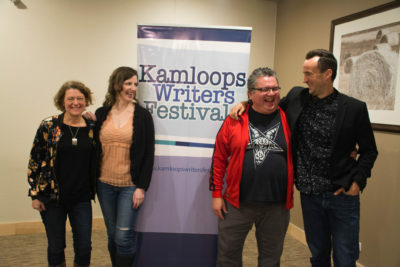 The Kamloops Writers Festival is continuously growing, and with that, the growth of the creative community in Kamloops is thriving.